Instead of small talk & a gnome door. I came across this list on the internet – I don’t have the original source and it was off of tumblr which…well, you know you can never find the original source so who knows. I hate small talk. I’d much rather talk about something…meatier, for lack of a better word, than the weather or something equally inane. Mike and I are going to a barbeque Saturday evening with a group of people we don’t know well and I may refer to this list so that we enjoy ourselves a little more. Not that we *expect to not enjoy it, but…we can be pretty anti-social and this seems like a very extroverted bunch. Anyway, I thought I would share. 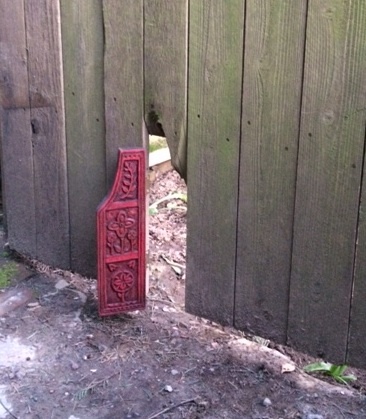 I also thought I would share a picture of the gnome door a friend made for us to repair the broken fence board. Much more interesting that just your standard repair, and I like how it is hinged; a real working gnome door.